Next trip: New York. This blog is also a bit of an experiment in which Neil and me try to merge our different writing styles. I let him edit my text and ad his own text to some of the pictures. So don’t get confused by it. Anyway, for me this the first time in the United States of America. Our first hassle is to get through the strict security at the airport and then we’re off for an 8 hour flight. The flight is great, and the hours pass a lot faster than expected, with in-flight movies, plenty of food and drinks, a little bit of sleep and no turbulence. We even land early! New York New York the city so great they named it twice. First time in America, you tend to look for things big or bigger than in Europe. First thing I notice: the airport toilets are bigger! Bigger seats, spacier cabins, and constant automatic flushing, wasting huge amounts of water! We have to choose between train or taxi, and go for the taxi. Both options are clearly signalled. A taxi ride from Kennedy airport to Prospect Park in Brooklyn, where we stay at the Best Western Plus Prospect Park hotel, sets us back 62 dollar ( because the taxi driver took the long way on the Belt road via Coney Island) so with the tip it costs us 70 dollar. A taxi from the hotel costs 55 dollar flat, so I think we will do that for the return trip to the airport. We check in and are pleased with the comfortable room. This is good value for the price we pay. (760 dollars for 4 nights and two persons, all included: state tax and city tax) You can only check in from 3 pm so we have to wait a little but there is free coffee and tea all day from the breakfast room ( and a coffee maker in the room as well). After unpacking and refreshing, we still have the whole afternoon ahead of us and decide to head for the Brooklyn bridge. We buy a subway card for 9 dollars, which gives you three rides and some change ( a ride costs 2,75). We get out at High street and walk towards Brooklyn bridge park. The sight of the New York skyline and the humongous bridge is really overwhelming and gives us a great first impression of New York. As a bonus the clouds break and the sun comes out! 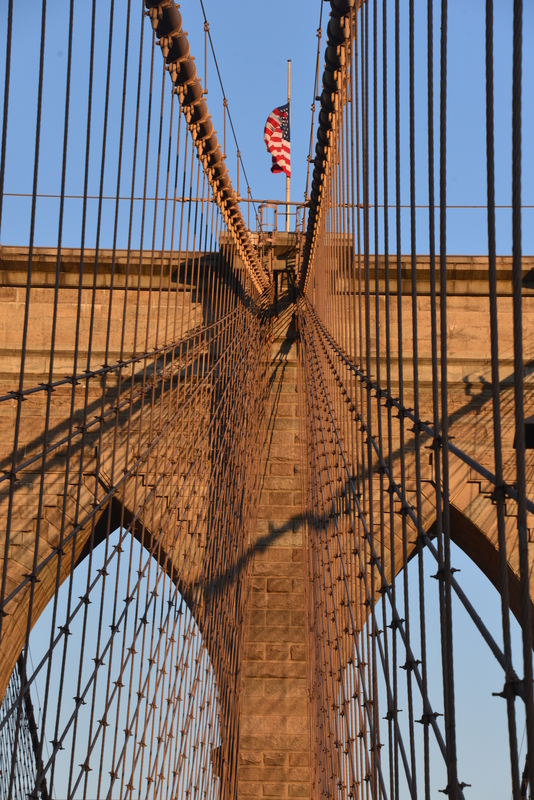 We order a home-made cranberry lemonade at the Brooklyn bridge garden bar and, feeling some hunger pangs, we head for a pizza from Grimaldi’s, a mere 50 m further on. Grimaldi is famous in Brooklyn for their coal brick oven fresh baked pizza’s. You can choose between a small (1-2 persons) or large (3-4 persons) tomato or white pizza, (14 dollar for a small regular pizza, 16 dollar for a large), and choose extra toppings for 1,2 or 4 dollars. We go for the small tomato pizza (tomato, mozzarella and basilicum) and extra peppers, mushroom and anchovies. The pizza’s are indeed very good, and really crispy and a small pizza is really plenty enough for two ‘normal’ eaters. After the dinner we climb onto the Brooklyn bridge. 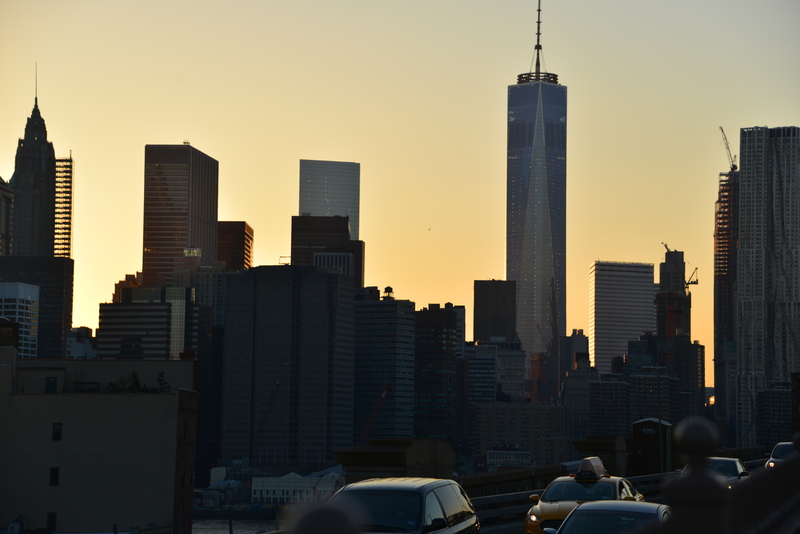 The sights from the bridge are impressive, especially with the sun setting behind the skyline of New York. You walk above the traffic, on the right side you see the other two bridges (Manhattan and Williamsburg bridge), on the left side stands the Statue of Liberty. We take lots of pictures, and then, getting really tired after this very long day (by now it is already the wee hours in Europe), head back to our hotel for a long refreshing sleep. 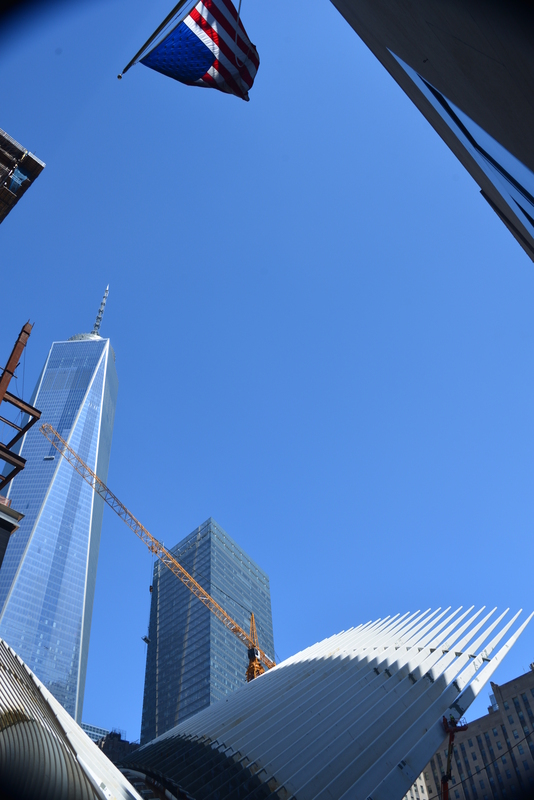 We take the subway into Manhattan, and since the R line has a stop just in front of ground zero, we start with a visit of the 9/11 memorial site, where the new WTC tower is just finished. ( the site is designed by Libeskind). 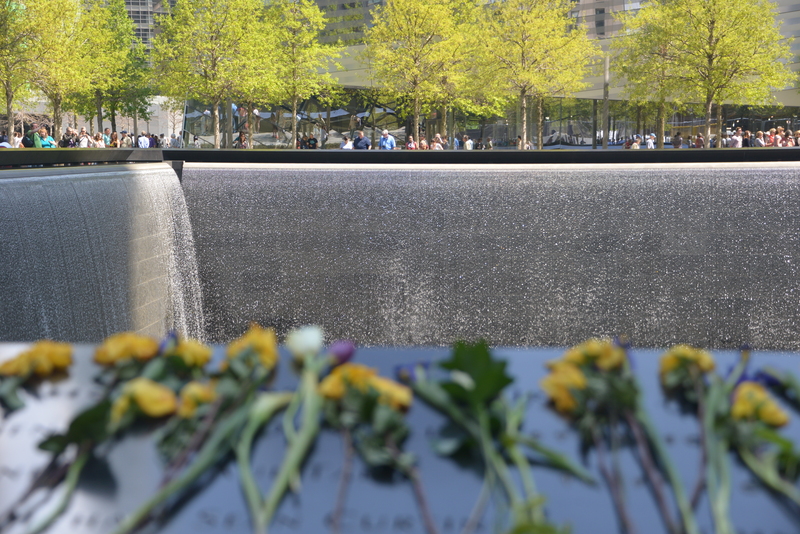 The two memorial pools with the names of the victims around are truly impressive and very symbolic, with the the water on top velvety like silk, then shredding into thin strips going down, and disappearing in a deep black hole with no visible bottom. It feels a lot like the two towers disintegrating into “nothingness”. Only one tree survived on the site and it has been nourished back, and now stands proudly back on the square, renamed “the survivor” tree and it is splendid in its full bloom. 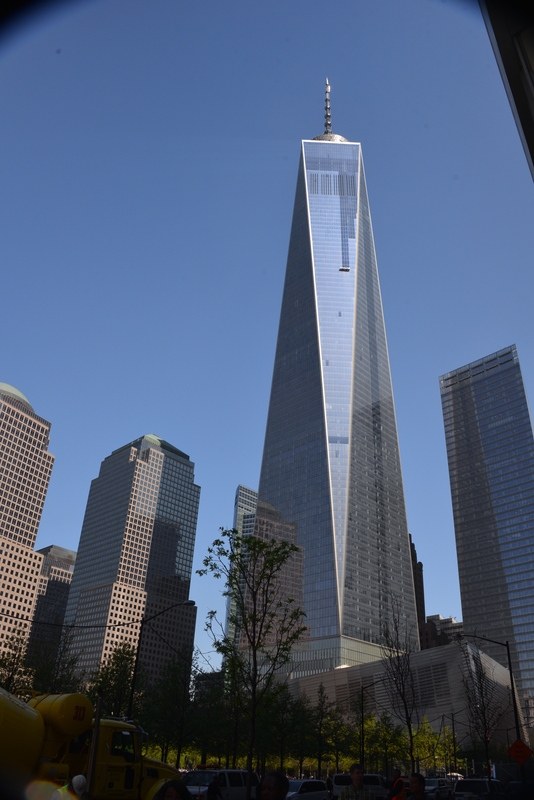 The new glass tower, the “Freedom tower” that is just finished, will only open on May 29th 2015. 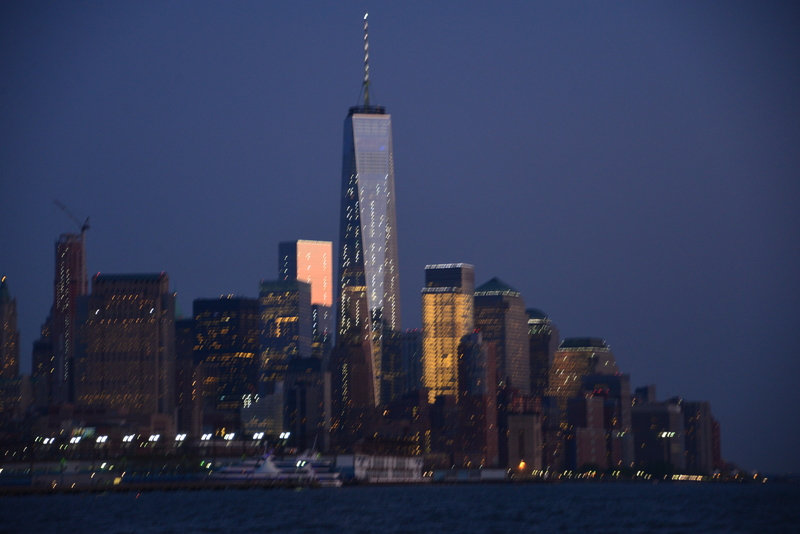 There will be an observatory (“One World observatory”) in it, and a lift going up, projecting the development of the New York skyline, from its start in 1600 up to today, the 9/11 attacks included. Next to the memorial they are constructing a new train hub (PATH station), with a futuristic space-like station on top. The relentless construction noise disturbs the serenity of the deeply moving experience a little. But then, this is New York, you can not expect not to hear noise. Walking on “Ground Zero” is an experience that is more than just emotional. Everybody remembers 9/11 and where they were that fateful moment. I was in Vietnam, watching the whole thing on CNN from my hotel room, glued on my TV set the whole night. And like everybody, I knew that the world had changed that very moment. But what I couldn’t know then was that, fifteen years later, I would stand on that very same spot, in awe and admiration for how the Americans have turned their defeat into a victory. Sadam Hussein is death, Al Qaida is old news, the Americans have a black president and their popularity has soured again, from an all time low under the Bush administration. And the new world Trade tower, from the mind of a Jewish architect no less, stands erect like a huge swollen fallus towering over the city and showing ‘the other side’ an ‘up yours’ that can not be misunderstood. We then walk into the financial district, and it strikes us how close the towers are from Wall street. Al Qaida had really hit New York in the heart. We walk past the Trinity church and say hello to the Wall street’s raging bull and Vera gently carresses its shiny brass testicules for good (financial) luck (and also for fun, I guess :-). We take a picture in front of the New York Stock exchange in Wall Street, hop into Tiffany’s&Co to gawk at the diamond rings. We say ‘hi’ to George Washington in front of the Federal states’ building, turn into William’s street, and then into Pearl street. The weather is just gorgeous and the patrons have put the terrasses out, to the delight of the Financial district yuppies who are enjoying their lunch in the sunshine. Non-yuppies we are, yet join them at ‘Zigolinis’ on Coenties Slip. The shrimp salad is delicious but the price of the beer is a bummer. A whopping eight dollars for a simple draft! 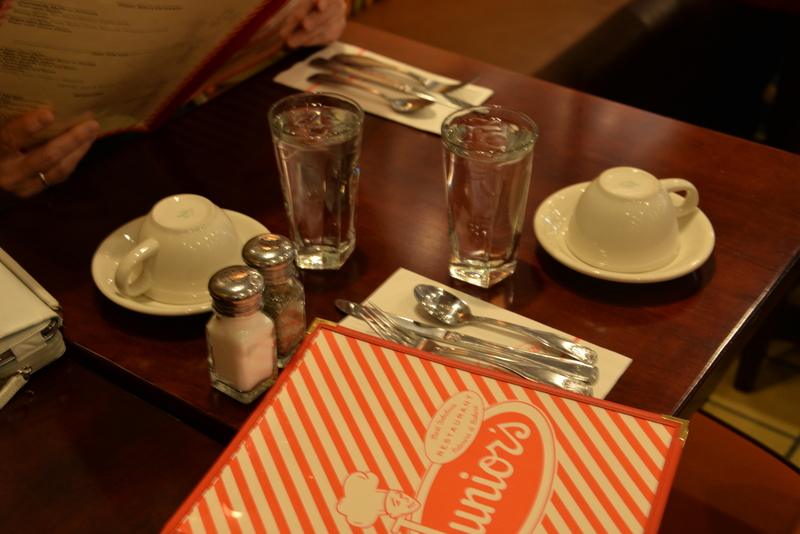 You can also take out food from Zigolinis deli and sit down at one the tables set out on the street in front. (We are puzzled also by the neighbours at our table, who also have a shrimp salad, but eat only the shrimps, leaving the lettuce for decoration!). Passing the Vietnam war memorial we walk in to Battery park, from where you can take the Staten Island ferry ( if you want to get a closer look at the statue of Liberty). That Ferry is free! We will visit Lady Liberty later, but first take the metro instead in the direction of Chelsea and get off on 14th street, close to the new Withney museum, to enjoy a walk on the high line track. The high line is an old converted train track, used to bring goods into the city, at the start of the last century. The rail line passes big packhouses that are now converted into apartments. The high line is like an elongated roof garden, a beautiful urban park, with chairs and benches and scattered works of art. (one by a Belgian artist!) Close to the start (at Gansevoort street), just above Chelsea market, you can stop for an ice-cream or a coffee. With the hot weather we go for the ice-cream from L’Arte Del Gelato ( not cheap at 5 dollars for a small cup) but ‘oh’ so delicious! You can descend back to street level by stairs or lift at several places on the track, but we walk all the way to the end. Unfortunately, the last part that will bring the visitors close to the Hudson river, is still under construction. We have some time to burn before our scheduled sailing trip to the Statue of Liberty (Oh Yes, we like to do things in style! ), so we walk to Madison square gardens (really nothing of interest there) and take the metro to the Flatiron building ( hardly anything else of interest besides the Flatiron itself). We take a peek inside the Empire State Building and also this is a bit disappointing. (yeah, OK it is a nice art-deco interior, but No King Kong) so we go for a coffee at ‘Gregorys coffee’. We lounge a while but suddenly realize that time has flown, and hurry back into the subway to get to the Chelsea piers. The rush hour causes further delays on the subway train and in the end we really have to make a run for it, to get to pier 62 in time to board the ‘Adirondeck’, a beautiful wooden Schooner sailboat (Classic Harbour line) for a two hours sunset sail trip towards the Statue of Liberty. 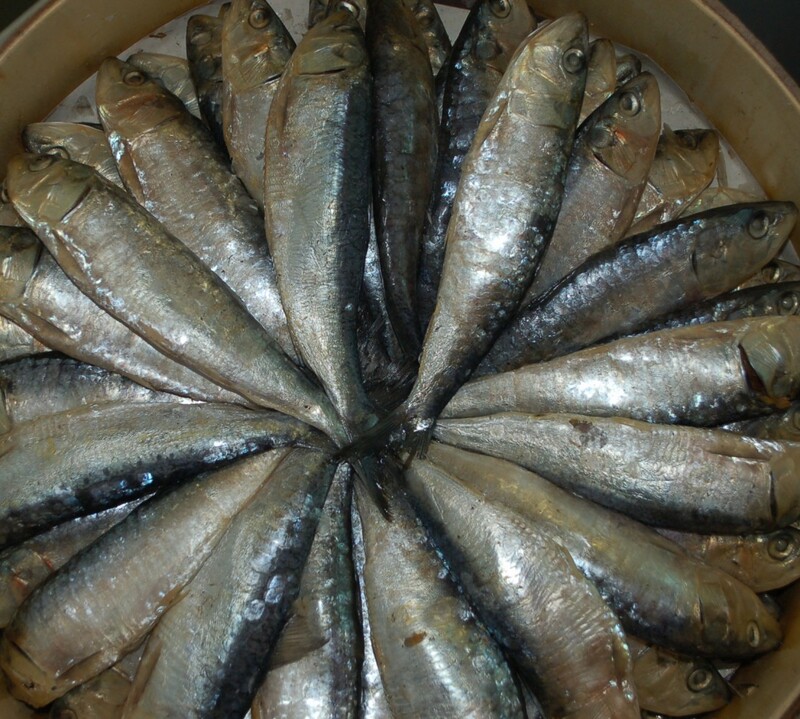 It is still early in season and the boat is only half booked. We have ample space on deck and feel like kings and queens. They serve three rounds of drinks (soft, beer, wine, sparkles) and with a steel blue sky and a gentle steady breeze, the weather could not be more perfect! 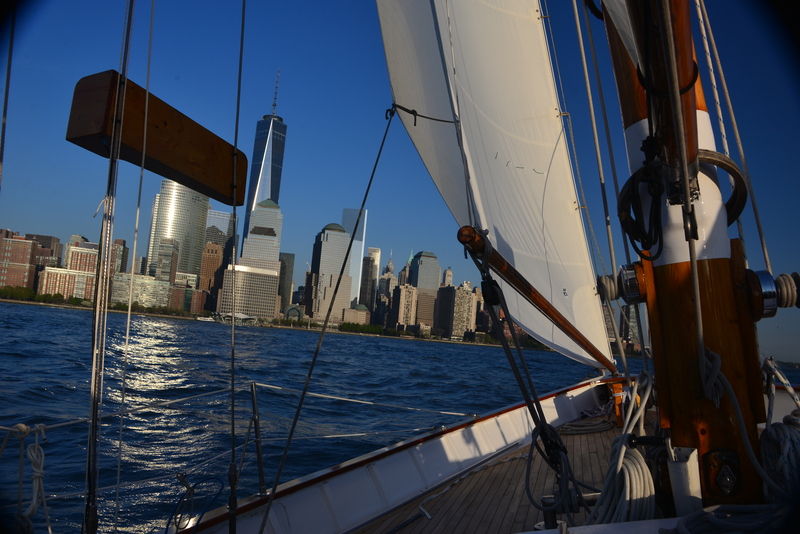 After leaving the harbour the engines are killed, and the boat majestically sails towards the enigmatic statue, while slowly the sun sets and the Manhattan skyline turns on a thousand lights. 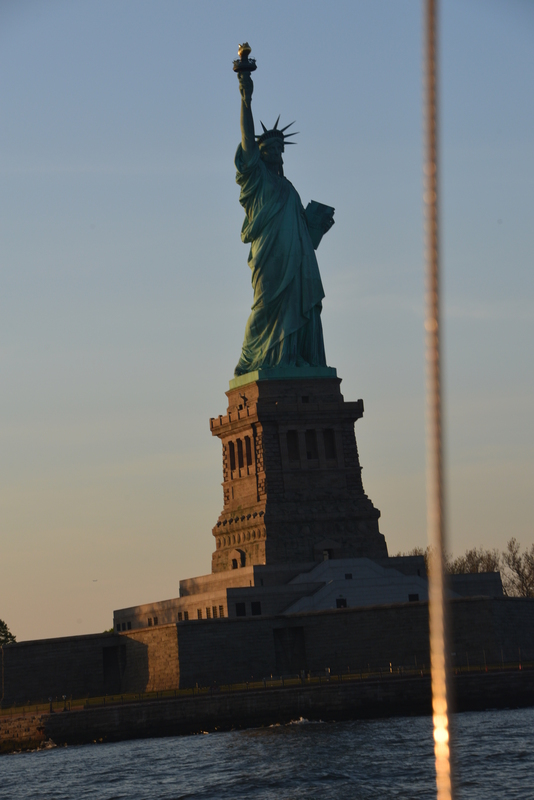 I can recommend the trip to anyone, there is no better way to greet the Statue of Liberty and the New York skyline! It is simply magical. Vera’s birthday present was the ultimate, my highlight supreme. She had chosen a sunladen day, with a nice breeze and a sky of the bluest lapus lazuli, to embark us on a double mast Schooner upon the Hudson river towards lady Liberty herself. Off we sailed, five and half knots in a gentle breeze, passing Staten island and Ellis island and marvel at the sights of lady liberty quickly approaching at stern side. I must have shot over two hundred pictures, Manhattan in full view, the setting sun blasting like fire in its thousand windows. A Pinot Grigio in one hand, squeezing Vera’s leg with my other. It was a perfect day and I was perfectly happy, there and then. We duck into the metro again, this time to Broadway, Central Park side, and walk towards Times Square, which you have to see after dark. Honestly, to me it is not really a highlight of our visit. Just a bunch of huge billboards and people gawking at huge screens like rabbits staring into the oncoming lights of a truck. We go for a bite and try 46th street and have trouble finding an inviting enough place to eat, even if the street is lined with restaurants. This was not our idea of a place called ‘Hell’s Kitchen’. We eventually enter “Yum Yum” at the end of the street, a Thai restaurant. The food was good and not pricey, so if you are like us and can see past boasting neon-lights and loud luring titles, and if you like Asian, try the Yum Yum, it is Yummie! It has been a long and great day! The third day starts with sleeping in, the hotels’ breakfast and then the R line to 57th street just down from Central Park. We want to rent a bike for a sportive afternoon rolling through the park, as a welcome alternative to all the walking. Well, I do not understand how mayor Bloomberg wants to promote cycling if renting a bike sets you back 14 dollars an hour!! Even the citi-bikes seem cheap at 10 dollar for 24 hours, but not if you can only drive them for strolls of 30 minutes max., every ride that is longer costs you 4 dollar for 30 minutes extra and 9 dollars for an hour extra. The metro and even a taxi suddenly seem dirt cheap! Central Park. I sigh: Time changes all things. I see endless pastures and forest that take days to cross, I see Indians, on foot, on horseback chasing deer. I blink my eyes and what remains is a park where you are charged 14$ an hour for a bike ride. I see crystal lakes that date back to the last ice age, the melting snow overflowing into the Hudson. I see beavers dams and a family of Grizzly’s scooping giant salmon from the falls. Eagles soar the sky. I blink again and see an artificial tortoise pond, and joggers showing off their stupidly blown up pectorals and all that remains of the ice age are ice cream vendors, vending ice cream. Specks of dust, are we, within the blink of an eye turned back into nothingness. So we walk again, but not through the whole of Central Park, that would kill us. We decide to see only the lower third, with the fountain, the lakes, Loeb’s boathouse, the castle, and of course the strawberry fields, in remembrance of John Lennon. 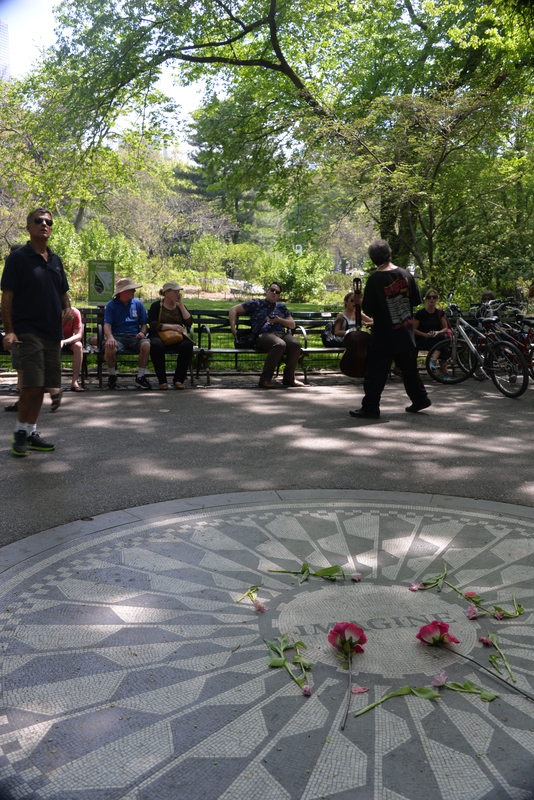 How tranquil the park is, so busy it becomes at Strawberry fields and the Dakota building ( where John Lennon was shot in front of his house and where Yoko Ono still lives). The building is covered in scaffolding, so not much to see here either. I can’t ‘imagine’ John would be amused. I also don’t think John worries much whether he is remembered this way. Yoko Ono on the other hand probably has a field day with this. Want some quiet? 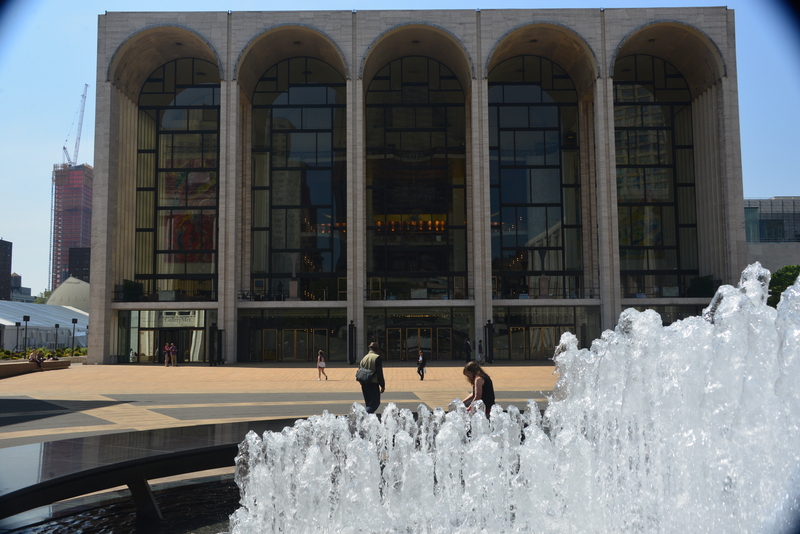 Follow us and stroll towards the Lincoln center, (via 64th St.). The centre’s square is a haven of tranquility, where it is wonderful to while some hours away reading, talking, eating or drinking something. Chairs and benches are plenty available. Do not forget to glimpse at the huge Chagall paintings at the windows of the Metropolitan opera house! 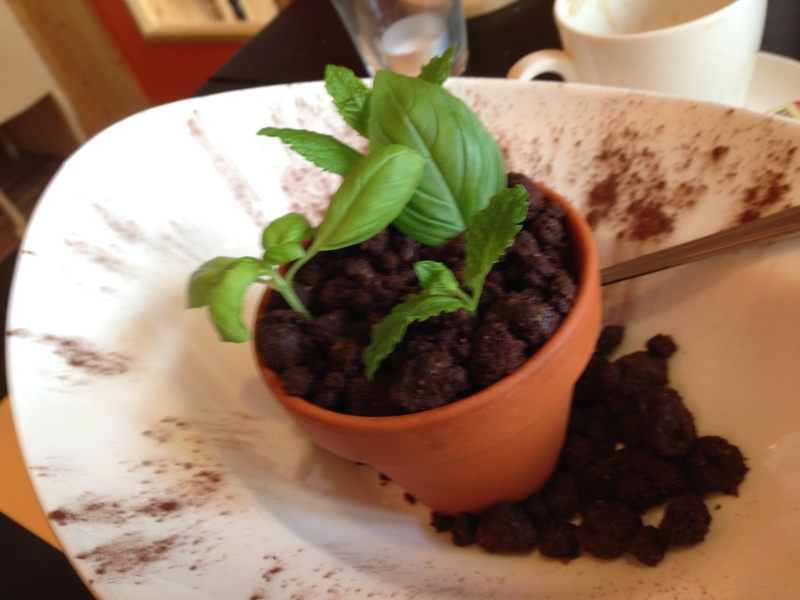 We enjoy another L’Arte Del Gelato ice cream and an Illy coffee. So, here we are, sitting in the shade. Lincoln Center and its square are really cool! We enjoy a cappuccino and take it all in. It’s been a magic couple of days so far. I’m forever in Vera’s debt. She’s prepared this trip to so much detail that it seems to have my personal tour-guide right next to me. Much more than this, I love her for just being here and sharing this beautiful experience with with me. Then it is time to ‘head for the MET’, a real art institution not only in New York but worldwide! Too bad that the rooftop garden café only opens next week, we miss out on the great view over Central Park! Important note: the entrance fee is what you choose to donate! The ticket price of 25 dollars, as advertised, is just the ‘recommended’ entry fee! In reality you can get in for as little as 1 dollar. But of course, one does not want to be that stingy when donating to this great temple of art so I give the cashier 20 dollar for two adults and she politely asks if I want change. I gracefully decline. So we get in for 10 dollar a head, a very fair price, and proud of ourselves, we decide to give them back the 30 dollars we saved out by enjoying cocktails in the grand hall balcony bar, where live classical music is performed on Friday evenings, when the museum stays open until 9 Pm. This way, the MET gets our money and we enjoy cocktails and a concert. Then we stroll into the museum. One advice: do not try to see it all! Choose wisely, and go for one or two periods, it will be hours worth. We first visit the European painters: with works by Picasso, Degas, Monet, Van Gogh, Gauguin, Toulouse-Lautrec, …. , and then head for the Egyptian section, to see the beautiful tomb, the many statues, with two wooden ones dating back more than 4000 years! 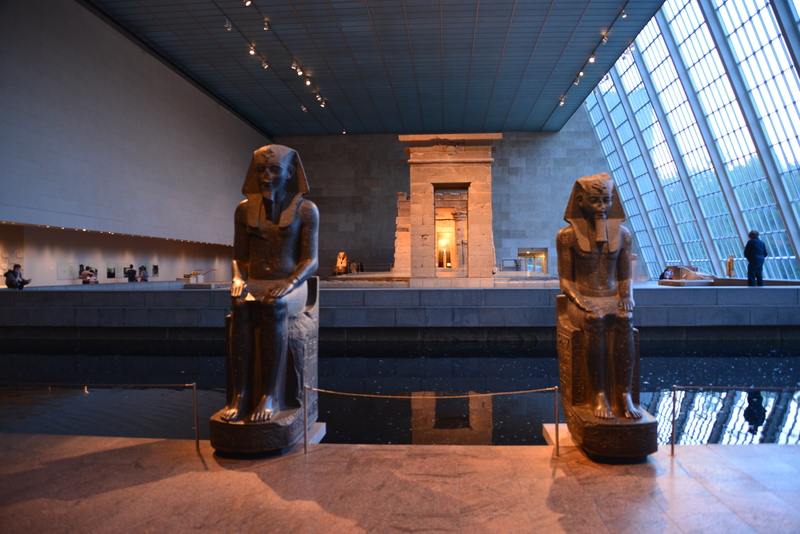 Then we descend to the very impressive Temple of Dendur, set in the Sackler Wing, a large hall. The temple reflects into the large pool in front of it. Finally, we visit the Chinese garden. Believe me, it is enough to satisfy your eyes and mind for a day. Being hungry and not wanting to wander off too far of, we eat a slice of pizza and a panini at ‘Don Filippo’s’ on Lexington Av. Tired but very pleased, we return for a refreshing sleep. The Americans love to build temples. The Metropolitan is a temple for art. A temple with temples inside it. I get goosebumps entering the magnificent room that houses the Nubian temple of Dendur. close to 4000 years old, this marvel of Egyptian art was literally rescued from certain oblivian and annihilation by the rising waters from the Assuan Dam. But even then, looking at the majestic sfinx, admiring the mystic hieroglyphs on the temple walls, I can’t help but think that an Egyptian temple belongs in an Egyptian desert. That, for me is the essential difference between a museum and a library. A museum is an artificial place. It is like a zoo, a place where rare and important pieces are collected to protect it from destruction or from oblivion. A library is entirely different. A library is the natural habitat for books. Books belong in it. They need to be there. The original copy belongs to the author, but the printed version has a home in the library, archived according to genre, language, topic or whatever, but identified and given a place in the world of words that we – humans – create to instruct ourselves, to evolve, to make us immortal. Junior’s, it doesn’t get more American than this. No wonder that both Clinton and Obama came through this diner on their election campaigns. Junior’s started out as a bakery from the Jewish immigrants, the Rosen’s, who were clever enough not to limit themselves to Kosher meals. It explains everything. Even if the current patrons and guests are more Afro American and of Latino origin, the most Jewish of Jewish pastries is still very prominent on display. 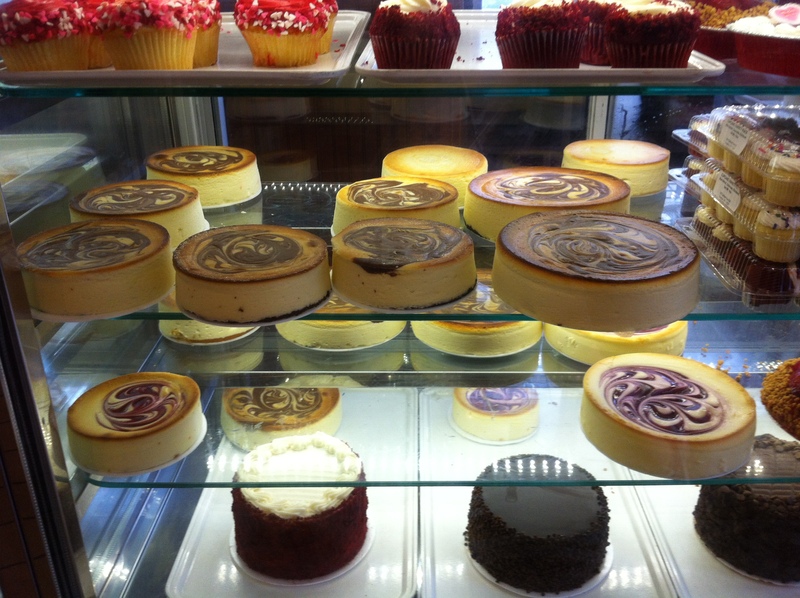 Gorgeous creamy cheesecakes. I tried the black-forest variety, but had to agree with Vera that nothing can beat the unadultered pure original version. 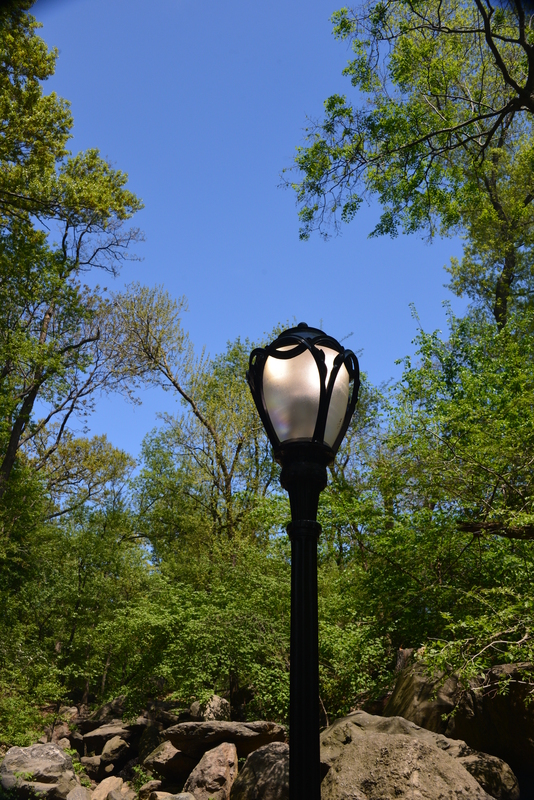 We take the metro to Bryant Park, a really small cosy park behind the National library. 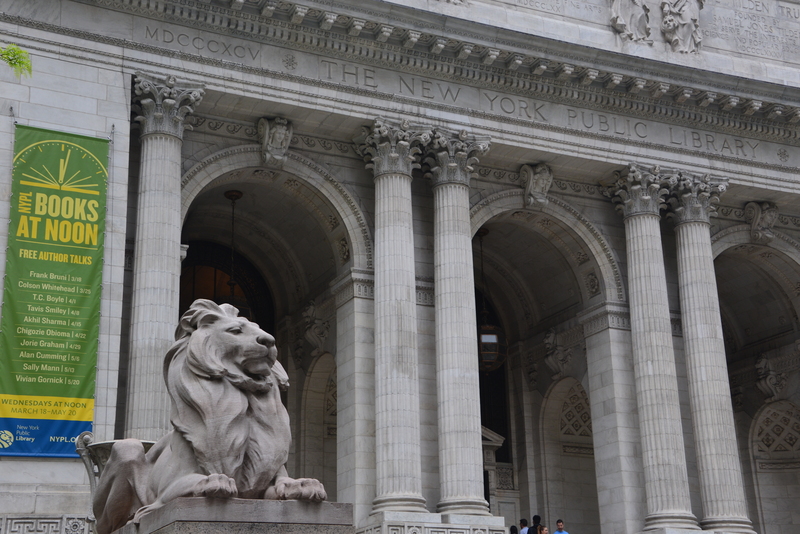 The library itself is protected by two lions, ‘Patience’ and ‘Fortitude’. 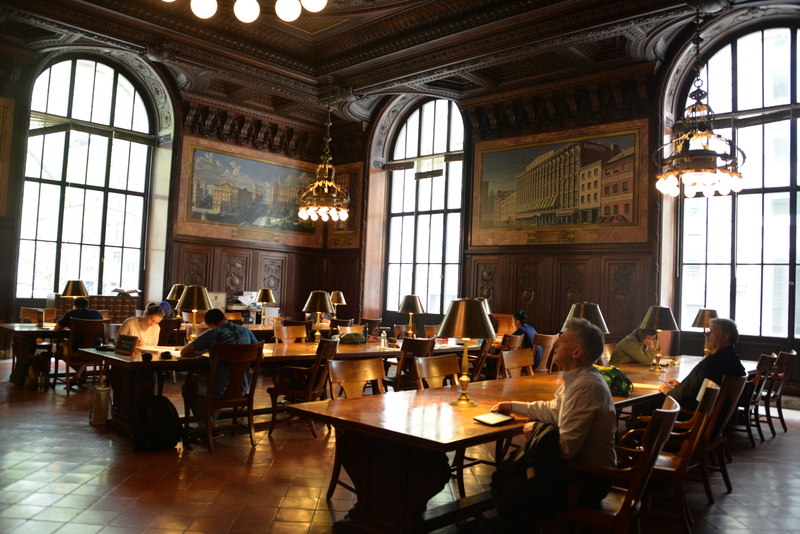 The library is housed in a beautiful Beaux-Art building with beautiful reading rooms. The ‘Rose Main Reading room’ and the ‘Public Catalogue’ room are unfortunately closed for renovations, so we miss those. Instead we visit the DeWitt room which is like smaller version of the Rose room but without the ceilings. Take a stroll through the building, but make sure to be quiet when entering the different rooms, it is still a library after all! I love libraries. A library is like a temple. Don’t care if that sound corny. I told Vera today, walking down the magnificent corridors of the National library of New York, learning about the generous financial support of Mr Carnegie, who understood that the greatness of a people is in direct correlation to the books on their library shelves. I told her that I loved libraries. it was a home for books. A temple for books. Next is the Grand Central terminal. Also a wonderful building, imposing, all marble and copper fixtures, a beautiful ceiling and a great clock in the middle. We go downstairs for a visit to the Central oyster bar. Even if you do not like oysters, go in, take a seat and order something, they have other seafood too, and a great wine list. The atmosphere is great, and the oysters are delicious. Leaving the oyster bar we see a man in the first corner on the left, his nose pressed against the wall as if he is a punished boy. It looks a bit weird, but when he steps away, all smiles, and walks towards his wife who is standing in the opposite corner. Then we realize one can talk to each other from one corner to the other, with the sounds transmitted over the arches like a phone. Hilarious! Try it when you are there, after us a father did the same with his daughter, and two girl friends were waiting for them to finish. Great for romantic conversations with your lover! ( it will make your day ) It is called the Whispering gallery! A bit further is the Chrysler building, just hop in to see the lobby (we forgot actually). 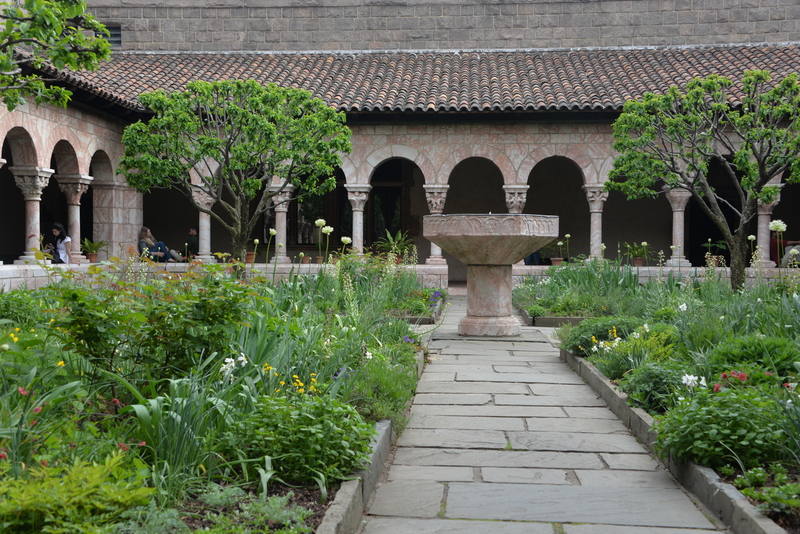 Hop on the Subway, all the way up North of Manhattan to see ‘The Cloisters’, the entrance fee is included in your MET entrance ticket. Take the express line up to the Cloisters, since it is quite an end away. When you get of you have to walk through Fort Tryon park, you see the Washington bridge over the Hudson on the left. There is a pretty medieval garden with medicinal plants. It is worth the trip all the way up North. Our last destination of the day is Brooklyn, where we have a famous ShakeShack hamburger ( but to be honest I do not understand what the hype is all about), and live music at BAM café ( Brooklyn Academy of Music). We take a drink and a snack (cheeseplatter) at the café because we are a bit early. Most people arrive at 8:30 for the concert at 9 Pm. At 9:30 pm, 5J Barrow starts their gig. 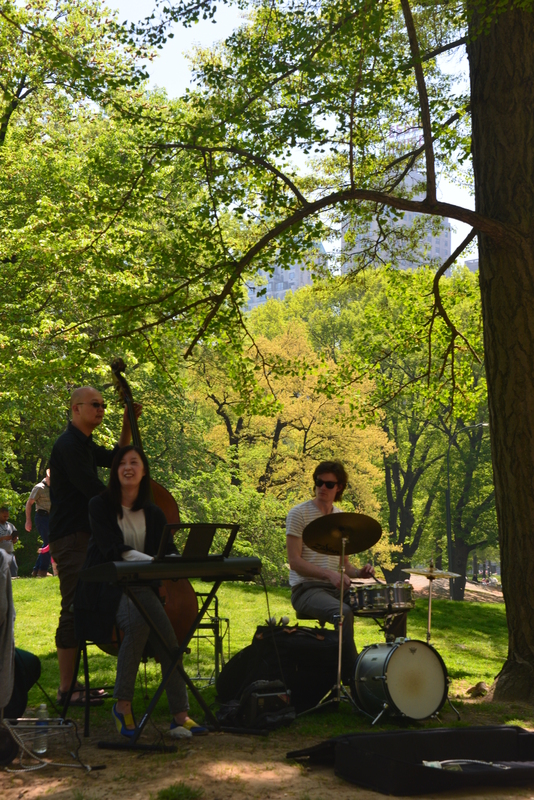 They were selected best band of Manhattan in 2014 and named best band of New York. They play folk with an Indie twist, and are really good. We enjoyed this end of our day! 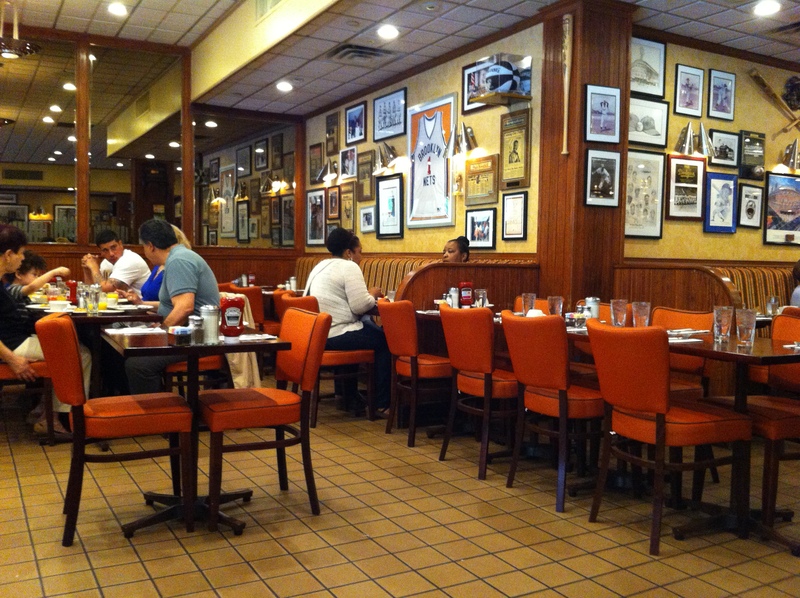 It is mother’s day and being in NY we do as the New Yorker does: we head out for a breakfast at Junior’s, where they serve a special holiday breakfast: coffee or tea, fresh juice of choice, breads and pastries and eggs, French toast, blini’s or omelette of your choice. It tastes a lot better than the bland breakfast at the hotel ( but then again, we realize that we are spoiled brats!). We visited Junior’s again for a nice brunch, on Sunday May 10th, mothersday. Well, I admit, these brothers and sisters do understand the art of celebrating mom. Prepped up in their Sunday’s best, they chaperone their proud mother, her face shining and flowers in her arms, through the isles and to their special table. Large plates with pastries, sandwich bread, followed by fried eggs, bacon, or delicious blinis, French toast, apple crumble and other richness ensure an unforgettable family Sunday to all. 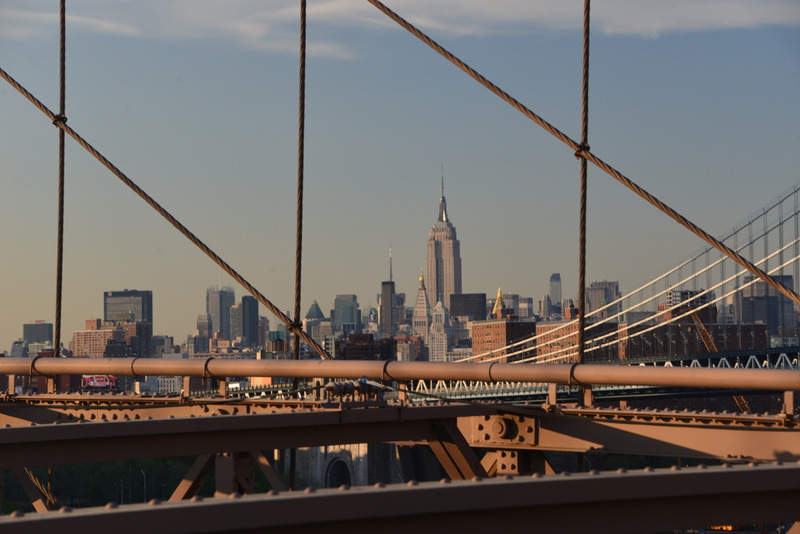 We head out to Manhattan for the last time and take the express train from De Kalb station, which passes over Manhattan bridge and gives you a great view of Brooklyn bridge and the NY skyline. We enter the Guggenheim, and are a bit disappointed with the building. We don’t visit it because the ramps are closed for repair. So out for some last minute shopping at Fifth av. We take a closer look at the diamond rings in Tiffany&Co (Yes mam, this ring is 2.5 carats, just under 100.000 dollars, Don’t worry mam, I can make it fit your thin long fingers…) For the affecionado’s, there is also a Bloomingdales ( with beautifully decorated windows), with all the big names as Gucci, Louis Vuitton and there is also A&F, ( renamed by my husband to “Applecrumble and Fudge”). We head for “Nike-town” to buy some sneakers. Unfortunately they were out of the ones I fancied in my shoe size. But more than that I am disappointed in the rude way we are treated here, I will not come again Nike! (I may however try to buy them online!). 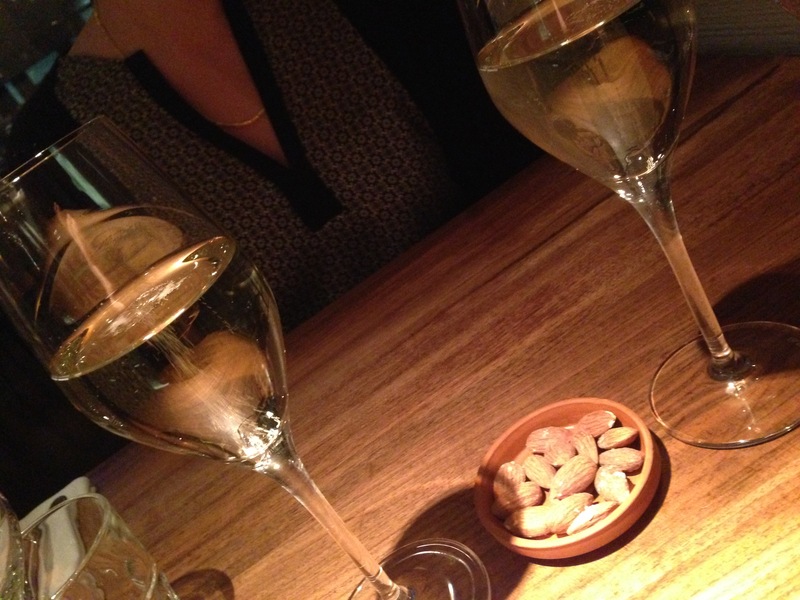 We drink a refreshing glass of Chardonnay at the bar of Brio nyc, at 61st and Lexington, before heading back to the hotel, in the cab, to the airport, on the plane and back home. I more or less figured out the Subway system of New York: you can buy single tickets for 3 dollar a ride, or buy a metro card which you can use with more than one person at 9 dollar plus one dollar for the card. With this card you pay 2,75 a ride. A metro card for 31 dollar for 7 days per person, will be the cheapest option if you stay several days, especially if you are staying outside of down-town Manhattan. We used the metro quite intensively, because distances are quite big. On most lines, you have local and express lines, local lines stop at each stop, express lines not, but move a lot faster if you have to cover a large distance (for instance from down-town Manhattan to Brooklyn, the Bronx, Harlem or Queens). On the lines Q, R and N, Q is the express line, on the lines 4,5 and 6, 5 is the express line. Many things are bigger and louder in New York: toilet seats, drinks, some people, skyscrapers, shops, and unfortunately also your bills! Huge amounts of tap water is wasted in showers ( you cannot adjust the amount of water flowing) and toilets ( in some toilets they flush at your every move). And there is a lot of noise in the streets and subway systems, people talk loud, and to get above all the other noise the ambulance and fire department sirens are deafening! What we saw very little is fruit and vegetables, only in the salad, and the freshly pressed orange juice, and some vegetables between my hamburger. Oh yeah, and the pizza, because pizza is a vegetable in the US. (No Joke, in Alabama one managed to get subsidies for pizza’s for school lunches. After all, pizza’s are made with tomato sauce on it!) But then again, mostly things are just like home, so don’t be scared, visiting New York is a great experience. Last day in New York. Time for some shopping. Dollars change hands very fast in this city that never sleeps. Soon enough it will be time to go home and make some new ones. That is exactly what America is all about. It is the only place in the world where you can not earn’ money but have to ‘make’ it. I’ll buy you flowers, dear, but on my terms, not his. We get a window table, and the smoky campfire fumes from the outside woodburner tickles our nostrils. Vera is thrown into a timewarp, back to her grandma’s farmhouse, where again she warms her feet to the kitchen stove while grandma stirs the pot of potato peels. Potato peels for the pigs, and hot creamy buttermilk pudding for the kids. The experience is so powerful she swears she can right here, right now, smell that steamy broth damping into the cold winter morning in her granny’s kitchen. So too the shrimp croquettes and the sole-meuniere, served bistrot style, with a glass of deliciously sweet white wine. René’s fries: another time-warp. Back to the ox-fat kettle, to when and where fries took up the distinct flavor of the fat, but still kept the taste of the potatoes too. Memories like priceless gems. Vera keeps them for special occasions, but when she opens that box, she wears them proud. And then her eyes sparkle like sapphires, and then her cheeks glow up into a ruby blush. And then again, I see that girl I know so well. Cudo’s to Frituur René. A gem in Anderlecht. Few days more ambiguous than Valentine’s day. 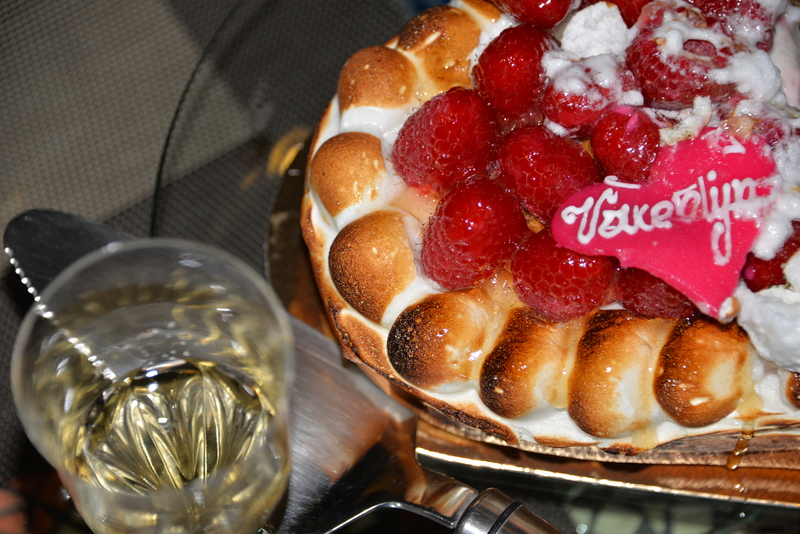 Created for consumerism, its intents thinly veiled as to make it a special day for your ‘cherie amour’. A cunning trap, Valentine’s day. Do nothing and you don’t care, go along and you are a materialist. We dreaded booking a restaurant for the event. The Valentine’s special was going to be overpriced and underinspired, with every dish smothered in symbolism and aphrodisiacs hiding in all corners. Surely shellfish, and asparagus daringly positioned, something with ginger and champagne sauce and specks of truffel oil. Who knows what else. Instead, we drove to Ostend, had a refreshing walk on the beach, cooled off in the silty breeze and then warmed up again over strong Irish coffee. Here I was, with my Valentine sitting right in front of me, her cheeks glowing from the cold morning air and flush from the Jameson whisky. I know I am a lucky man. The Saturday fresh market was in full swing and it was brisk business as usual at “Luk’s”, arguably one of the best fishmongers in Flanders. We got some fresh Zealand Oysters and lovely seabass. We asked for the heads and bones, to make a stock, but Luk shook his head; “too fat”, he said. “I have something better for you”, he then smiled and pushed two kilo’s of filleted turbot and plaice in a bag for us. Nothing can beat plaice for making a great fish stock! We drove home to cook our own Valentine’s dinner that evening. Far away from the city lights, with Jolan and Kathlyn’s jolly chatter for background music and with a bottle of Moutardier champagne to toast on each other’s company. A quick calculation told us the meal had cost us approximately fifteen euro’s per person. Cheap when compared to the fifty something we would surely have spent in town. Cheap yet priceless. Every day again, and every day more than the last, I cherish the moments when I see the three people I love most on this earth so close to me. And isn’t that what Valentine’s should be really about? We finished the evening at the Bruges’ concert hall, where Jordi Saval slowly rocked us into a hypnotizing slumber with his old Celtic music, played on four-hundred year old instruments, a Gamba and a Celloviola. The wild party out, the table dancing, the glitter of limelight and the all night cocktails rave will be for another time. Yes, we did it again, we ate at a restaurant just before they where assigned a Michelin star, and on their way to stardom! 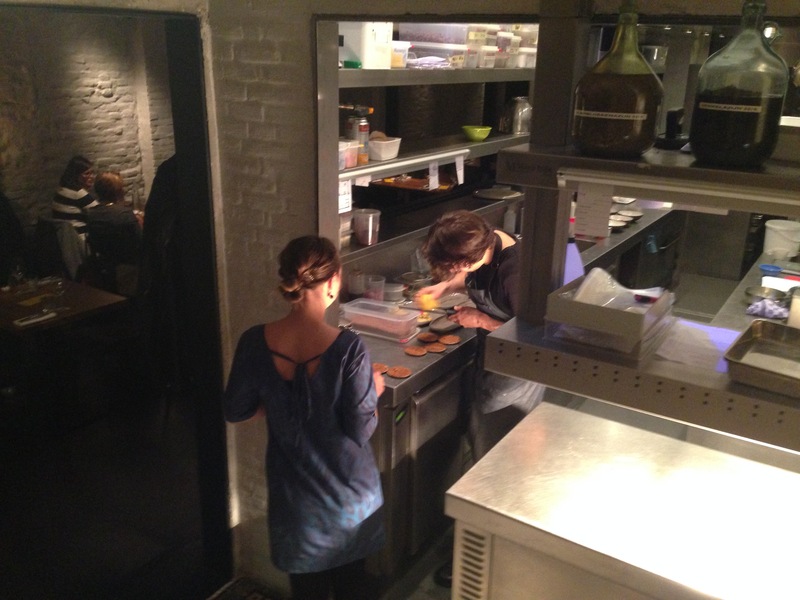 We were spending a night in Gent again, and looking for a new place to eat. 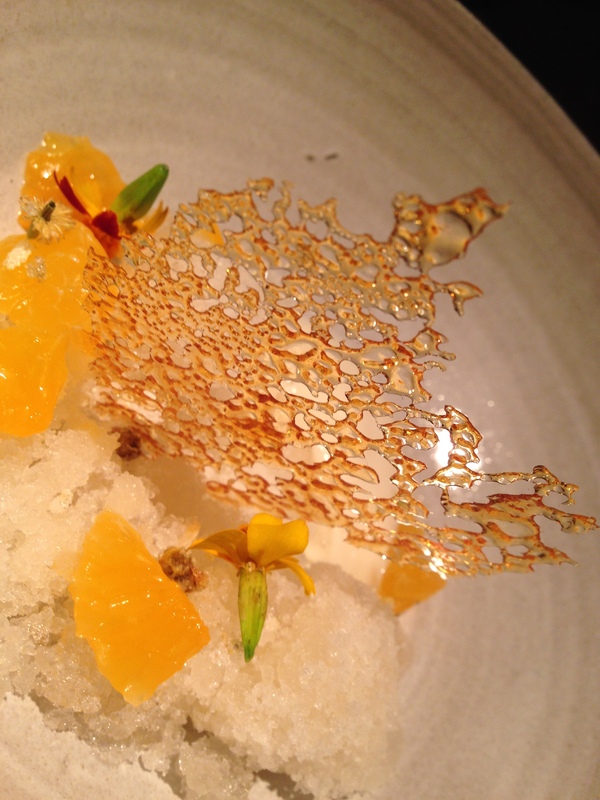 We wanted to try one of the new promising restaurants with young chefs trained in three Michelin star restaurants. But as usual we only booked a few days in advance and most restaurants, especially the trending ones, were already fully booked. On the website of one of them I read that they always kept some tables for late deciders (like us), which could be booked by phone on the days itself from 10 AM on. Neil took responsibility for the reservation, so around 11 AM I received a text message that he had booked a table at Publiek in Gent, yes! 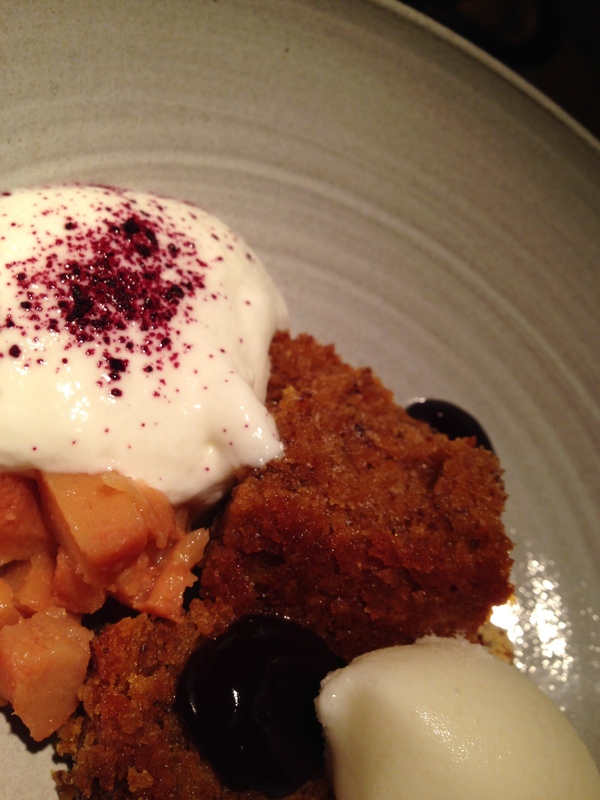 Publiek is run by Olly Ceulenaere in the kitchen, one of the Flemish foodies. I find it a great idea to keep some tables that can be booked on the day itself. It gives everyone the possibility to try these restaurants, as many people cannot book very far in advance, and therefore miss out on some restaurants who are always fully booked months in advance. I hope they keep this policy as a Michelin star restaurant. We had booked quite early in the evening, and when we arrived were told that we could take a table instead of the seats at the bar, which are I guess the seats often set aside for the late bookers. We were very happy, and sat down next to the wall adjacent the open kitchen. 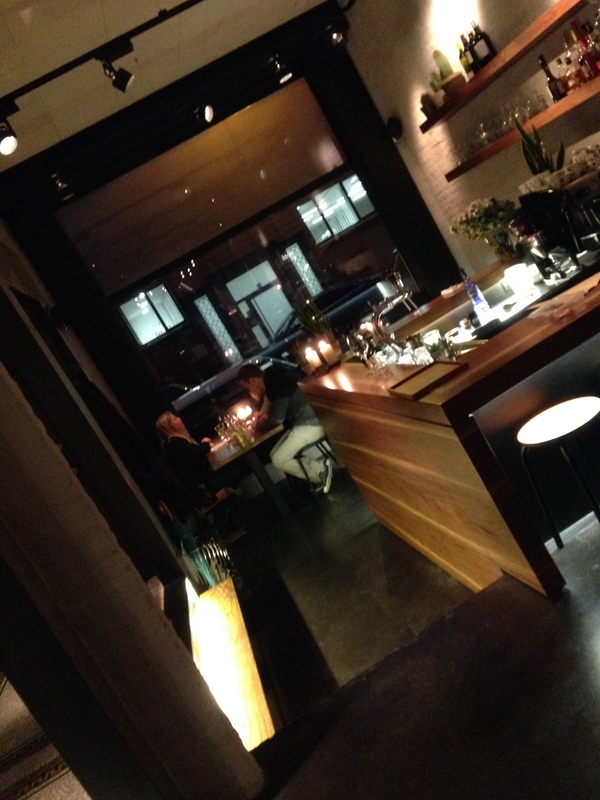 The restaurant, though very sober in decoration, had a very warm and relaxed atmosphere. I think the lightning, the natural wooden touches and the open space are responsible for the ambiance. The personnel is very young and casually dressed. We both chose the menu made up of five dishes (55 euro). You can opt for an extra dish, but we declined. We started with a glass of of Vouvray bubbles (8 euro/glass) followed two glasses of white Croatian wine, recommended by the hostess. The wine was really very good. You first get some homemade bread with butter with herbs and nuts, beautifully served, and a real treat. Each dish looks really beautiful, is well balanced in its aromas, pure and honest in taste, with original sauces and a lot of fresh herbs. It is a blend of the pure authentic taste of quality ingredients and the flair of good combinations spiced up with fresh herbs. You can choose between two deserts or a cheese platter. We each chose a different desert. I took a carrot cake which was delicious, Neil was a bit less pleased with his granité, which seemed to miss taste. He better go for the cheese platter next time. 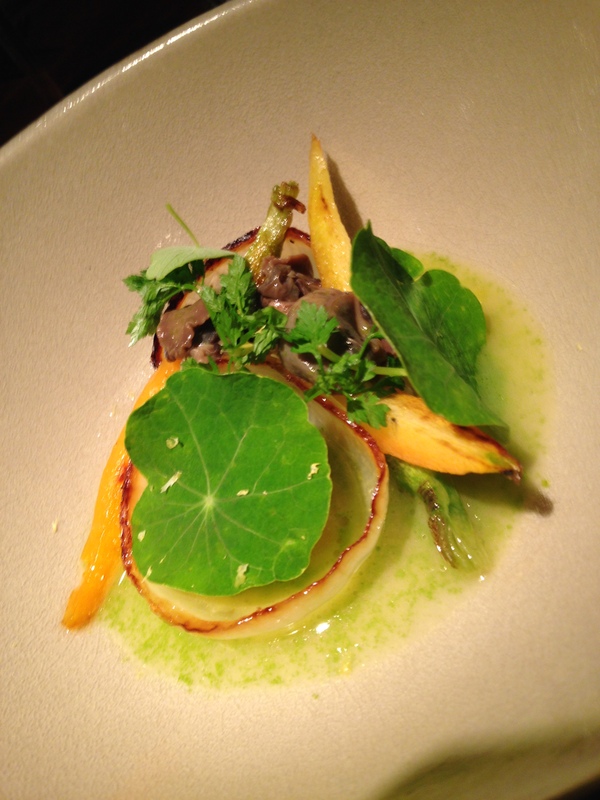 It was a great dinner, worthy of the first Michelin star they received last month. Congratulations Publiek! 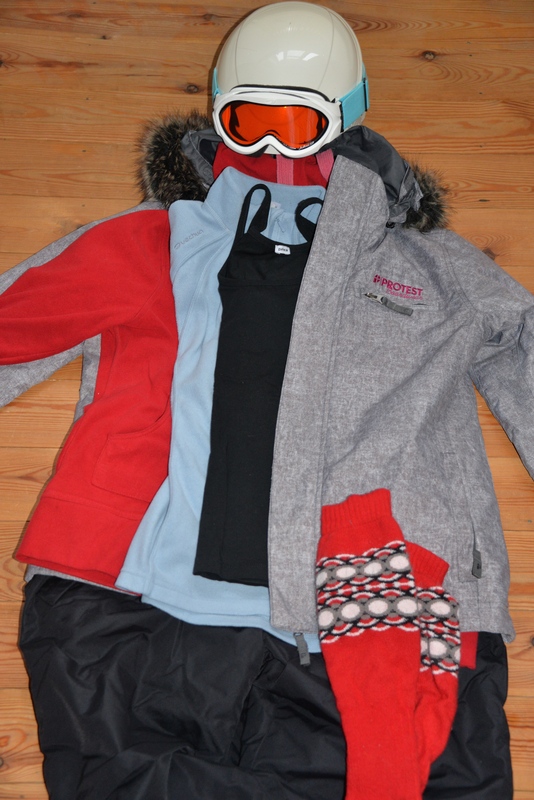 On our ski-holiday this year I realized I again forgot to take some essential items with me. Not as essential as my ski jacket or helmet. I took everything I basically needed to go ski every day, but I forgot a small back pack for instance, and really missed it almost daily. I therefore decided to write down the essential ski-holiday check list for next time, and why not share it with others, who might need it too! 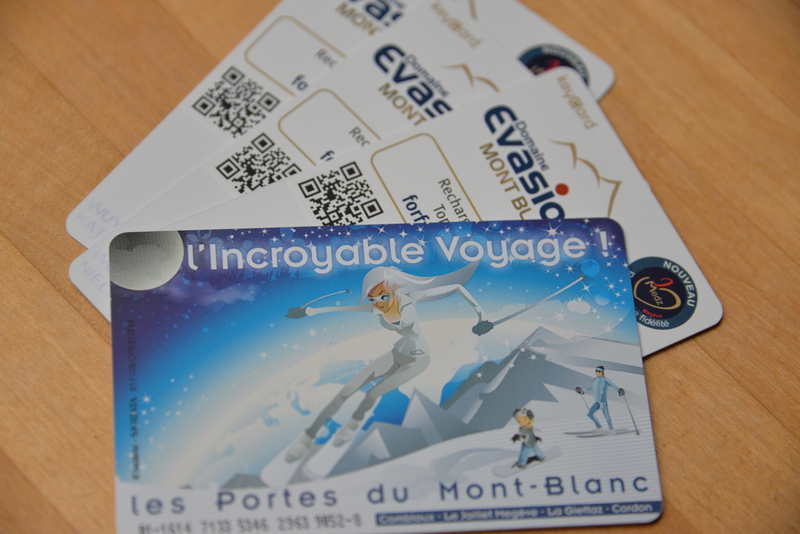 –Ski-pass In some ski-areas you can re-use your ski-pass (and not have to pay for it again). So keep it somewhere where you will find it- again next year. -a small or medium backpack (to take lunch, water, sunscreen, put away carfs, sunglasses…) -small thermos flask -some sandwich bags to pack lunch -a pocket knife. 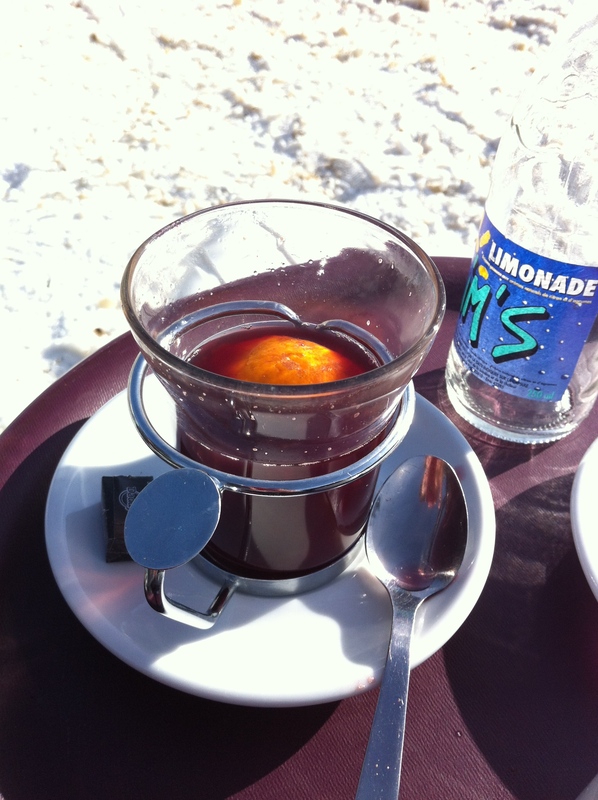 On very busy and sunny days you might prefer to eat your lunch outside on te slopes in the sun, rather than to wait for a table at one of the restaurants on the slopes for a much too expensive lunch. 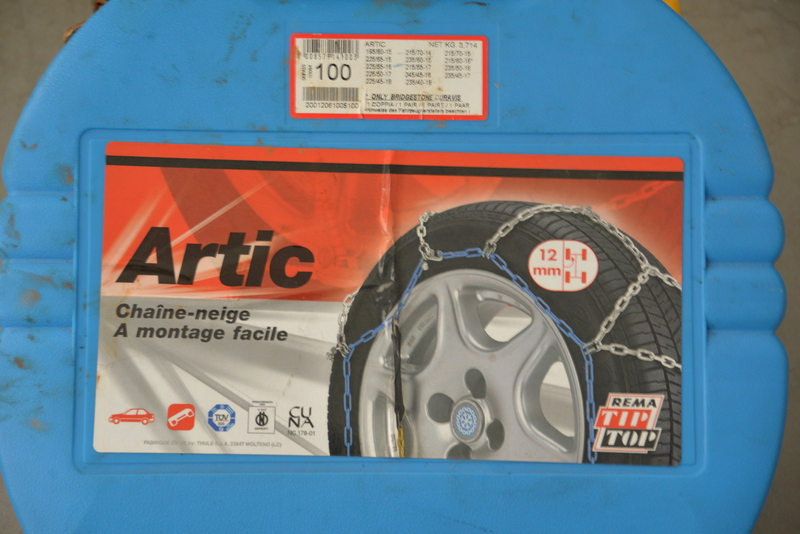 -a plastic sheet to put in the trunk of your car to put the wet skis and boots on after skiing, snow chains (do put them on at home at least once, so that you are familiar with how it works. 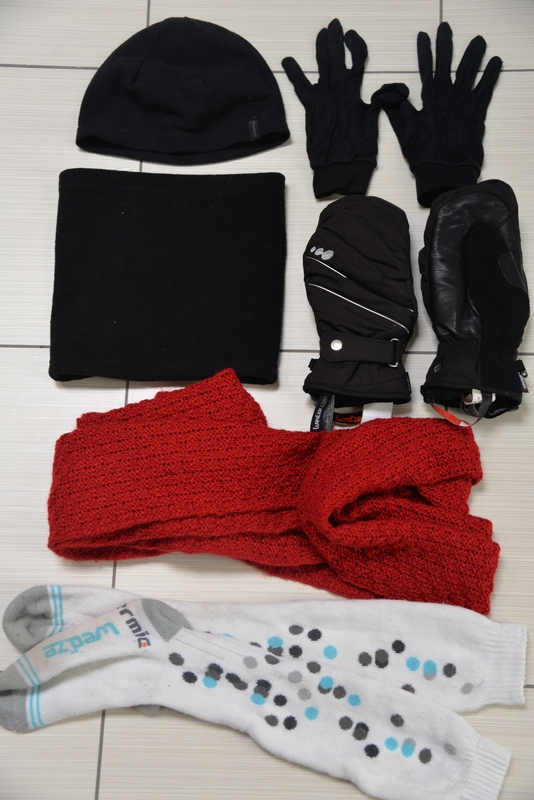 Most often you have to put them on when it is dark, in the snow, in cold weather …. ), and you can take some old gloves and an old sweater with you to put on your chains, because it is often a very dirty job! 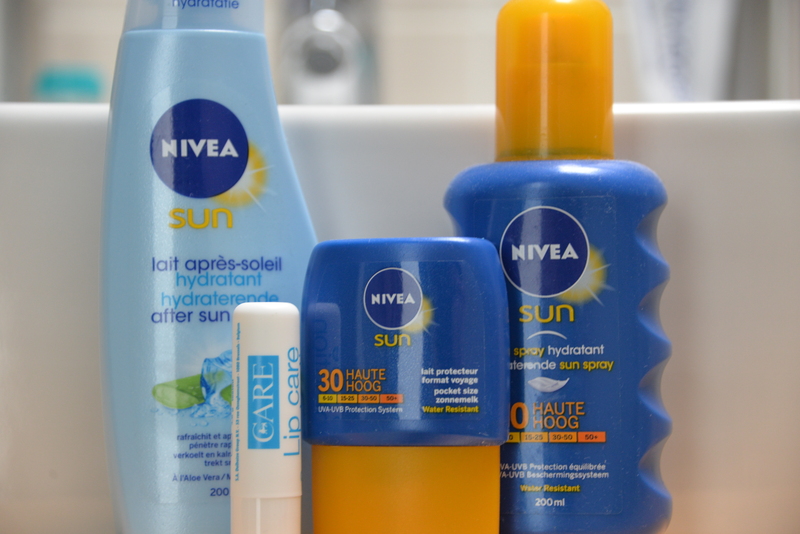 –first aid kit: -plasters -disinfection spray -wound healing cream -ointment for burns -after sun cream -facial cream (the cold dehydrates your skin) -painkillers -thermometer -other medication you regularly take. -Take the address and telephone number of your destination with you in the car in an easy to reach spot (do not pack it in your suitcase). -You are not the only one who goes skiing in the holidays, traffic tends to get really bad on these days, and if you are unlucky and the weather turns bad, who knows how long your trip will be: So pack enough food and drinks to cover one or two meals, with some extra fruit and cookies to munch. Gas stations are often terribly crowded on busy days during the holidays, so you can eat in the car instead of standing in an endless row for something to eat or drink. And if you are as unlucky as some during these last holidays and you get stuck in a huge traffic jam, you will be so grateful you packed food. -For the same reason do not wait until your gas tank is almost empty before filling up, if you get stuck somewhere you do not want to run out of gas! 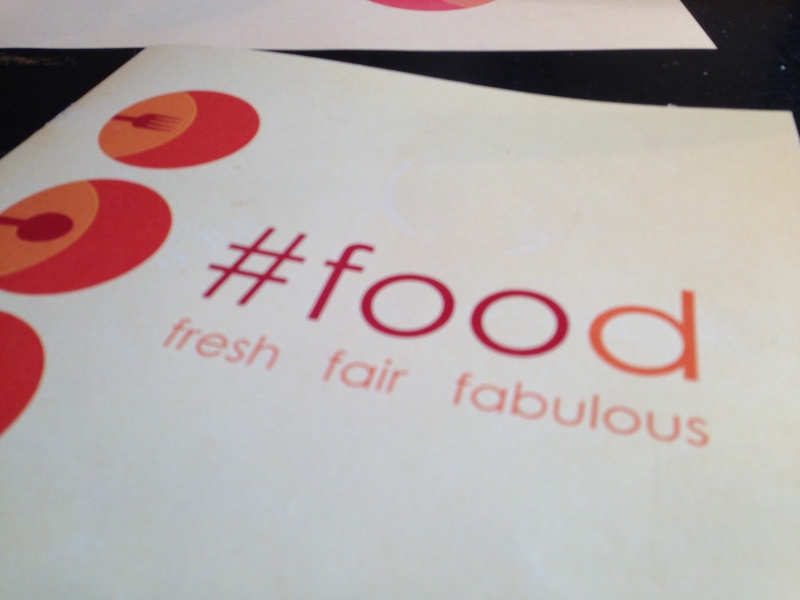 This time we looked for a hip, young, tasty restaurant in Bruges for the seventeenth birthday of our daughter, and we found this at #food. 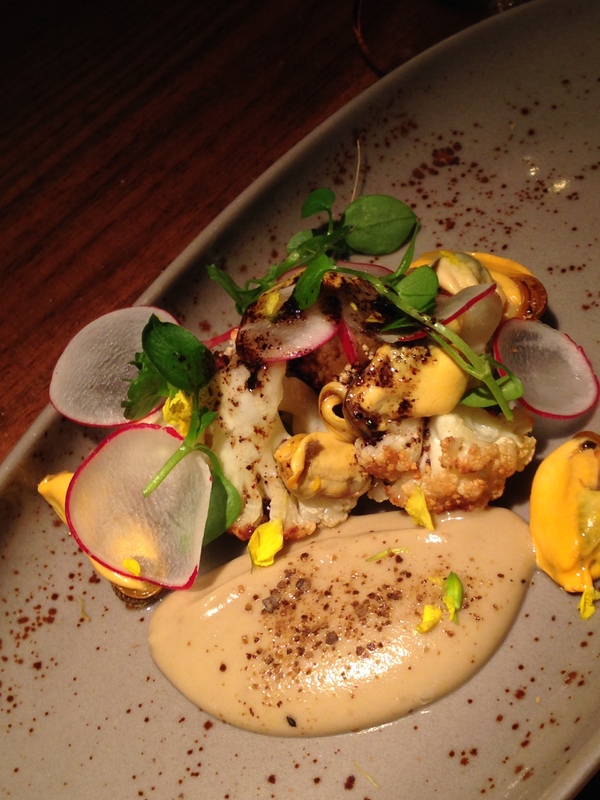 Relatively new but with very good reviews on Tripadvisor, #food fills the gap of young trendy restaurants. Bruges counts many good restaurants, and quite a number of michelin stars, but most of them are quite classic in approach (and expensive as well). It is located quite centrally, and quickly filled up on Sunday at lunchtime.We had made a reservation five days before, and the only minus point I can think of, is that they had given away the table at the window we had asked for. When I mentioned it, the hostess immediately asked the couple already sitting there if they minded to move ( they hadn’t ordered yet). It made me feel a bit guilty but they luckily did not mind. 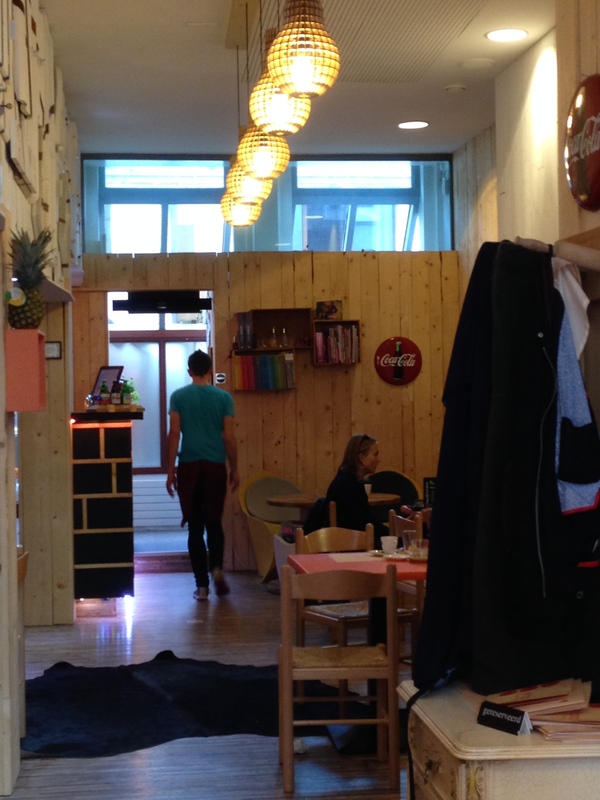 The restaurant is decorated in a seventies, recycled chic, using simple wooden planks and old cupboard doors to furnish the walls, and nostalgic seventies toys as decorative items. The menu is not fancy, proposing bruschettas, soups, burgers, salads, quiches, lasagnas and toasts, all fresh and homemade, using a large amount of fresh herbs and fruits as well as different kinds of salads. All the burgers are homemade and served on brown buns, and you can even try a burger with 30 % of worms and grashoppers in them. There is a good choice for vegetarians, and you can drink homemade lemonade. We ordered a plate of Bruschettas as a starter, each of us took a burger and we had Panna Cotta as dessert, while my son tried the Dave’s Wave. 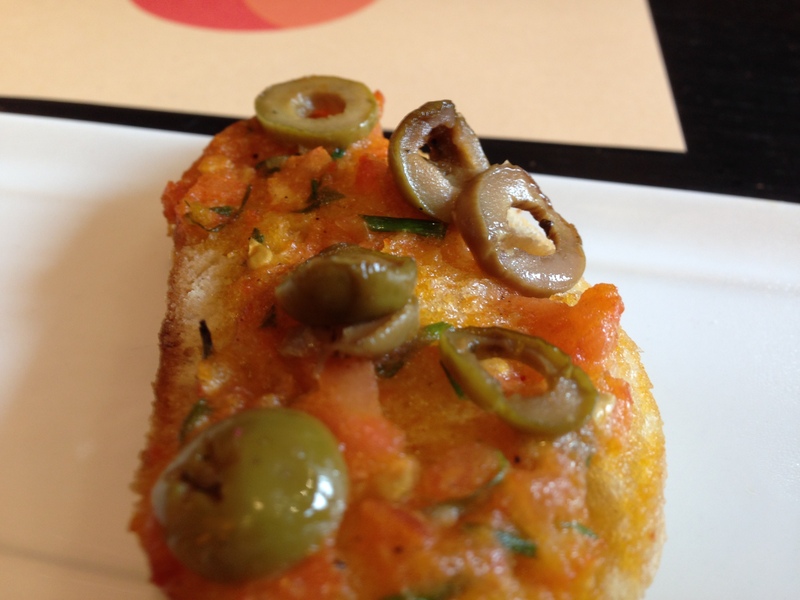 The buschettas are simple but really fresh and very tasty. 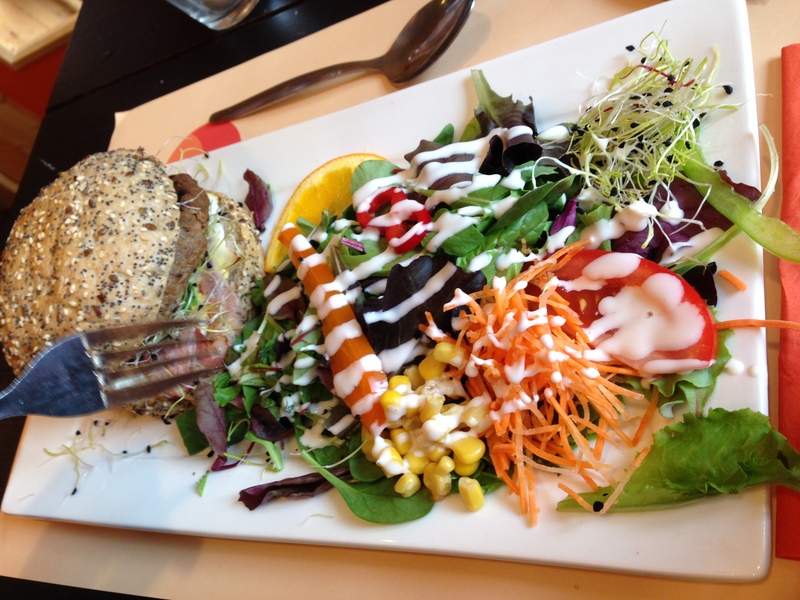 The burgers are really good, with a great salad, while the salads and dishes other people ordered also looked fabulous. 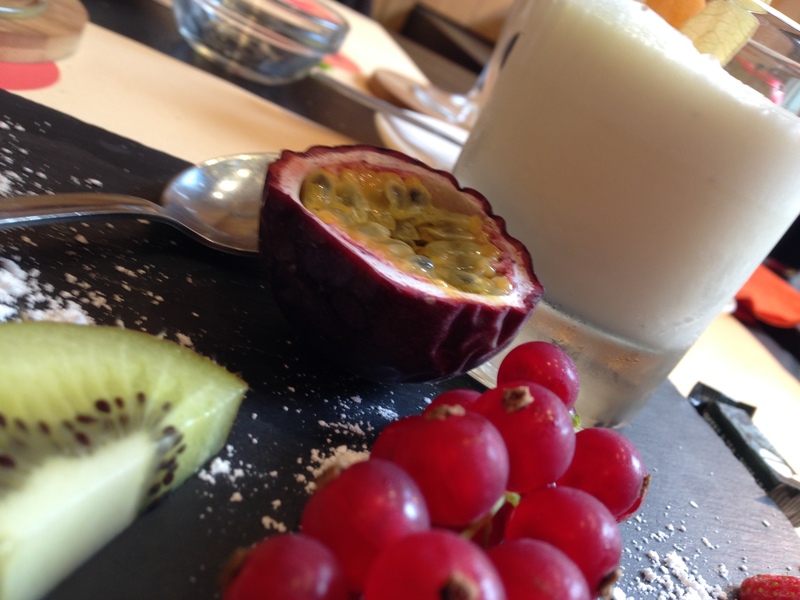 The Panna Cotta is good and obviously homemade, the Dave’s Wave looked and tasted great with a lots of fresh fruit. 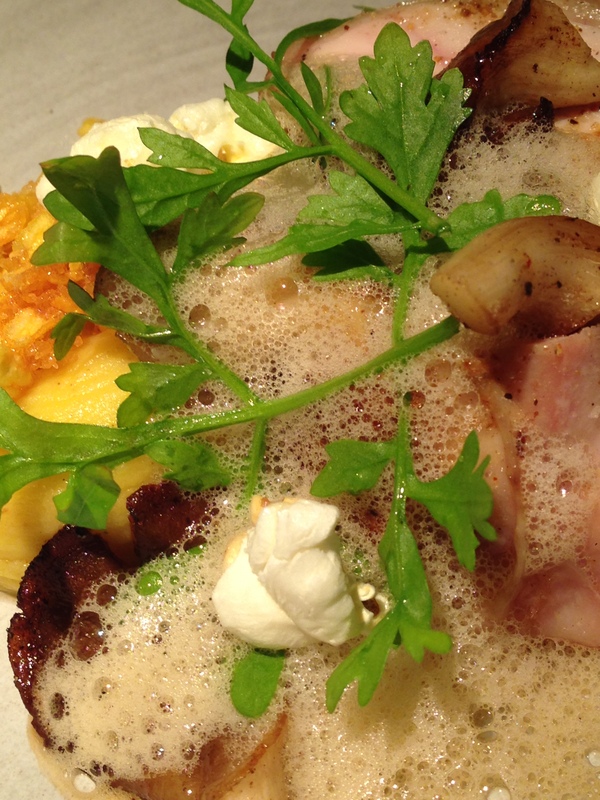 #food is a great find and really what we needed in Bruges, we will surely be back! And you can pay by card!